I just posted the photo tour and workshop schedule for 2014-2015 on this website. While it will be a few days until the last bit of information is added, the locations and dates are pretty much set, so check it out. *** If you are a Nikon shooter or if you know one, check in with Kandace Heimer at kc@kandfoto.com . She is selling a large inventory of her photo gear. I can vouch that she took meticulous care of those cameras, lenses and accessories. You will find some good buys with Kandace. In recent days, I’ve been photographing on some of the local photo ranches. Here are a few of the images from late May and early June. When you click on an image, it will enlarge and get sharper. “Previous” and “next” arrows are located on the left and right edges that will help you advance through the show. Common Ground-Dove pair drinking at ranch pond. 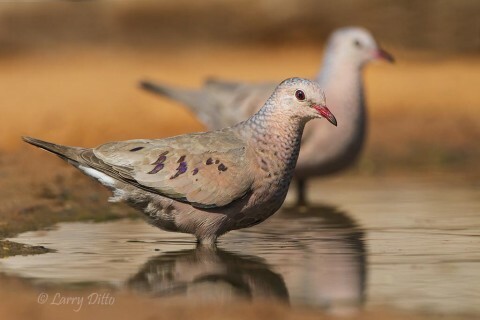 The doves were late afternoon arrivals at a small pond with photo blind. I liked the positioning of the two birds and the eye contact with the nearer dove. I captured the image with a Canon 7D camera, Canon 500 mm IS lens, Gitzo 1348 Carbon-fiber tripod and Wimberley head. This combination gave me 800 mm of magnification and lots of stability. A teleconverter wasn’t necessary to bring these little guys in close. The image stabilizer was off since the tripod offered the necessary support while shooting at ISO 400, 1/1000 second @ f11. There would have been a moment of vibration as the stabilizer kicked on when the shutter button was pushed. 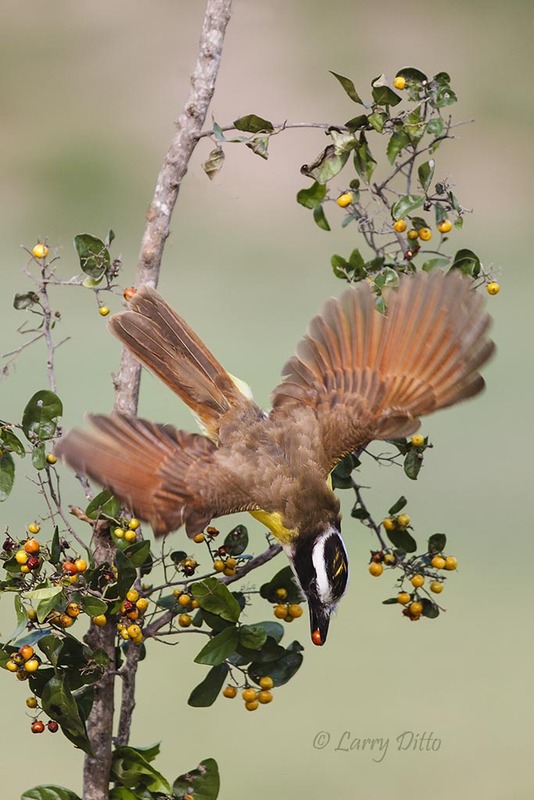 Great Kiskadee swoops down for an anaqua berry. The kiskadee was captured with the Canon 1D Mark IV, 300 mm Canon IS lens and Feisol carbon-fiber tripod and ball head at ISO 1000, 1/2000 second @ f4. It was the diagonal position of the bird and the open wings that I liked about the great kiskadee shot. 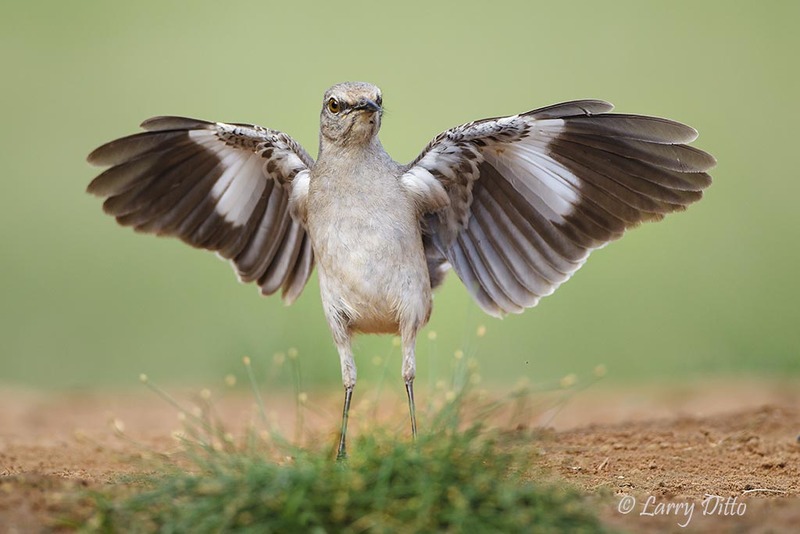 Mockingbirds like to flap their wings, especially when trying to scare up a bug. Image made with Canon 1D Mark IV, 500 mm Canon IS lens, Gitzo 1348 tripod and Wimberley head at ISO 640, 1/2000 second @ f4. From photo blind with Canon 1D Mark IV, 500 mm lens, ISO 1000, 1/3200 second @ f8. This scissortail was diving into a large pond and flying up to the perch to shake water from its feathers. 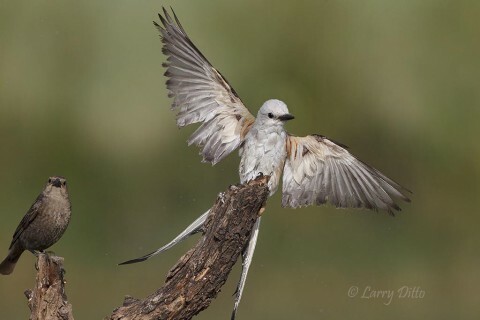 On this capture, I liked the wings and tail, but the bird was looking directly at me so the bill shape wasn’t distinct. On another landing, his head was turned. I elected to clone the head from the other images and superimposed it here…a perfect fit. The cowbird didn’t seem to mind. 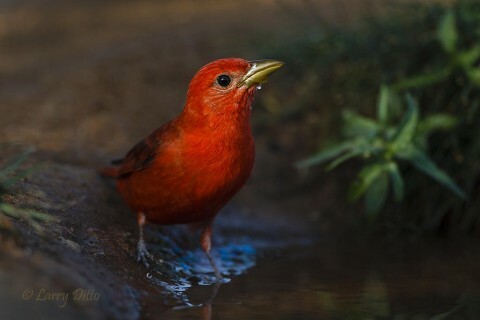 Male scarlet tanager drinking at photo blind pond at the sun sets. Canon 1D Mark IV, 500 mm lens, tripod and Wimberley head at ISO 1000, 1/1600 second @ f4.5. Using “evaluative metering”, I subtracted about 1 1/3 f stop of light to keep the eye and bill properly exposed while darkening the shaded area around it. The spotlight effect makes the shot. 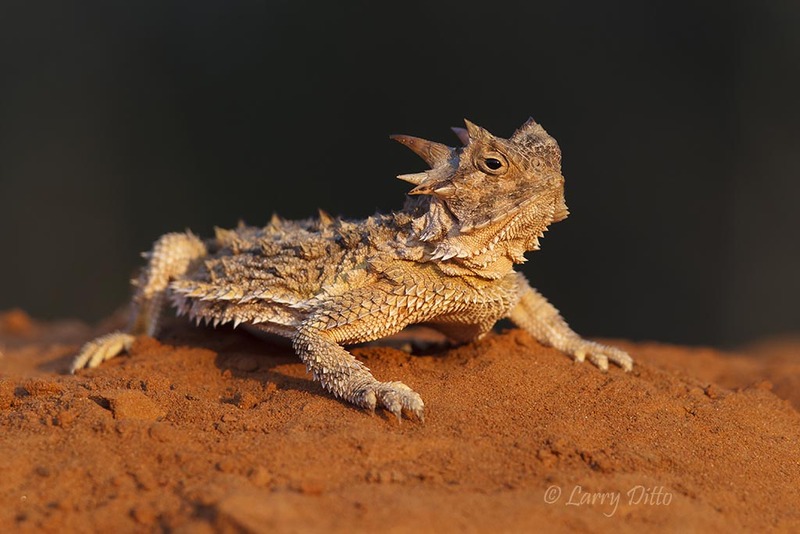 Texas horned lizard at sunrise. The warm light on this lizard was a combination of sunrise light and reflected light off the red soil where he was resting. Canon 1D Mark IV, 300 mm lens, Gitzo 1348 tripod, Wimberley head at ISO 1000, 1/250 second @ f9. 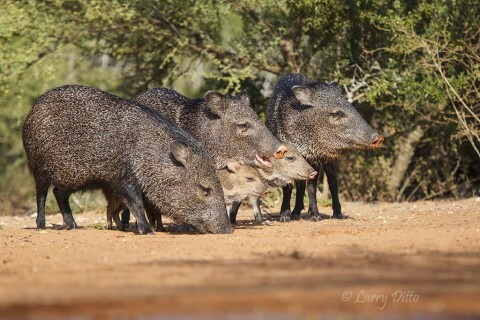 Collared peccaries of all ages feeding in a tight group. Canon 1D Mark IV, 100-400 mm lens @ 285 mm, from blind using Gitzo window mount with Arca Swiss monoball head, ISO 800, 1/2000 second @ f5.6. These collared peccaries (javelina) were traveling with young of varying ages. The babies try to stay behind or under mom for safety from predators. The dense brush in the background is their preferred habitat. Yellow-billed Cuckoo drinking at photo blind pond. Canon 7D, 100-400 mm lens at 275 mm, window mount and ball head, ISO 400, 1/2000 second @ f5.6. When the June temperature hits about 104 degrees as it was here, everything needs water. 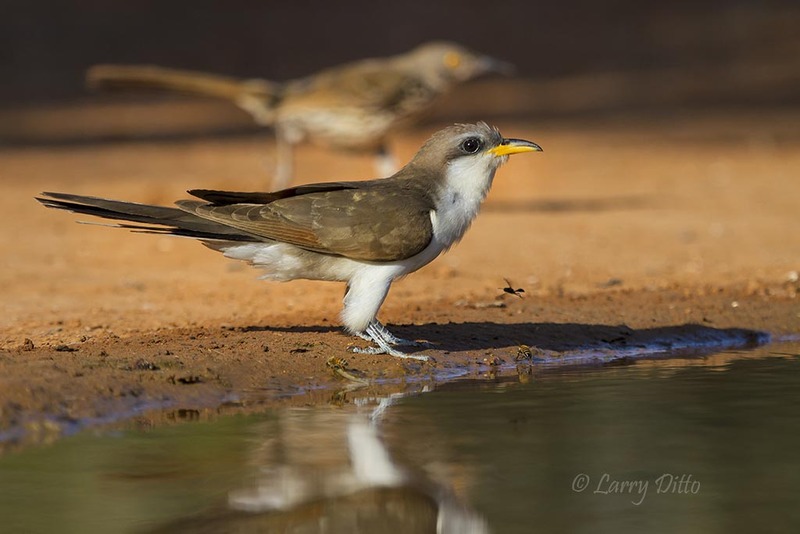 Under these conditions, the normally reclusive yellow-billed cuckoo ventures cautiously to a photo blind pond for an afternoon drink. The long-billed thrasher (background)was less wary. Carmine Skimmer with legs extended for a landing. Canon 7D, 500 mm lens, 1.4X teleconverter = 1000 mm of magnification, window mount and ball head, ISO 1000, 1/4000 second @ f5.6. When shooting gets slow at the blind, we find ourselves photographing wasps and dragonflies. 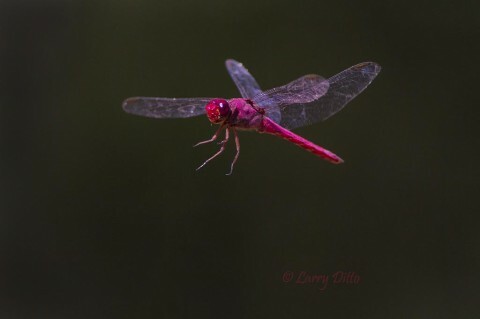 By pre-focusing on the perch and swinging slightly right and using a high shutter speed, I was able to capture dragonflies in flight. Aplomado falcon perched in yucca at sunrise. 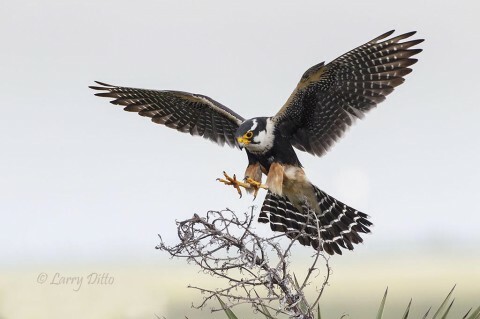 This image of an endangered aplomado falcon was taken from a blind in Cameron Co., Texas at sunrise. 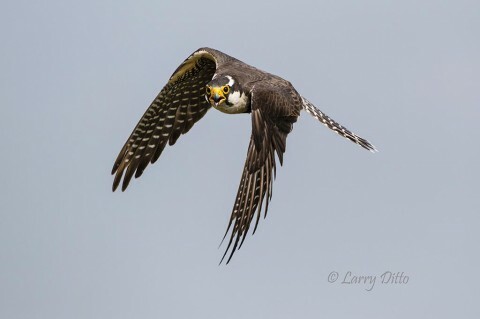 Aplomado Falcon in flight shows long, narrow wings built for speed. 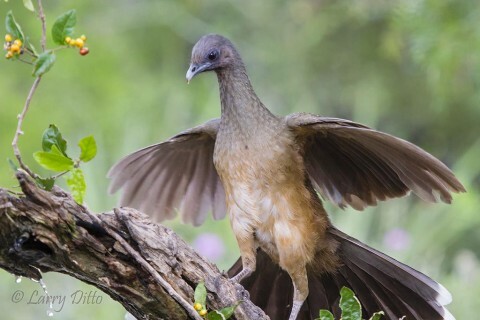 Canon 1D Mark IV, 500 mm lens, Feisol tripod, Wimberley head, ISO 800, 1/5000 second @ f5.6 to freeze wing motion. Adult aplomado falcon landing on yucca flower stalk. Canon 1D Mark IV, 500 mm lens, Feisol tripod, Wimberley head, ISO 640, 1/2500 second @ f8. 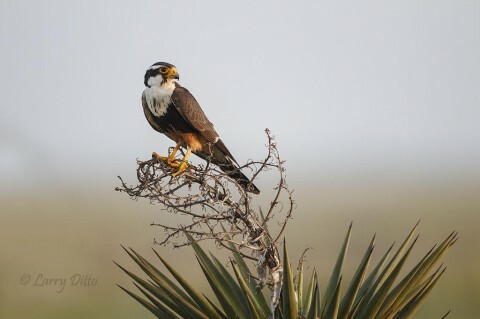 Realizing this yucca was the falcon’s favorite perch, I set up to catch a landing by pre-focusing on the stalk and then manually rotating the focus ring slightly to add about 4″ of focus distance. That let me get the bird with its wings open while landing. Of course, I had to set the shutter speed to stop the action (about 1/2000 second shutter speed will stop most birds in flight). Plain Chachalaca spreads tail and wings for balance. *** Don’t forget to check out the new photo tour and workshop schedule available on this website by going back to the home page.